I have been working on my Magnolia Quilt for the challenge but am not quite ready to write about that yet. I have to quilt the border, block it, bind it put an hanging sleeve on it, and then I will be done. Unfortunately, I have not been feeling great so I have been having a hard time getting myself to work on it. I hope I finish. I am not happy with my quilting. But I will preserve. I just hope, no one looks at the back. 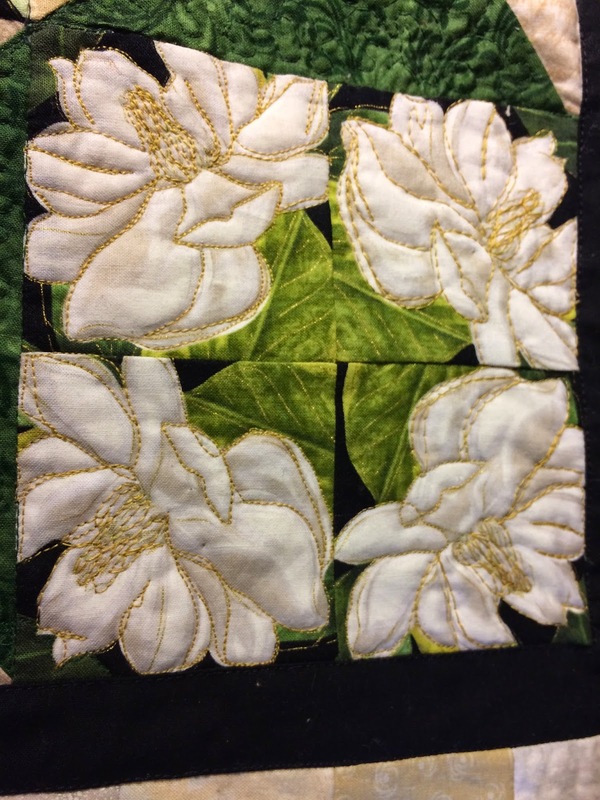 There are 13 fractured magnolias on the front and I have quilted on all the white part, I really think the leaves need it to, but not sure there will be time for that. I did a couple of post cards to help practice my free motion quilting, since I was using my small machine instead of the one I usually use and I wanted to make some for some friends of Celeste, that were having birthdays or just needed a little pick me up. 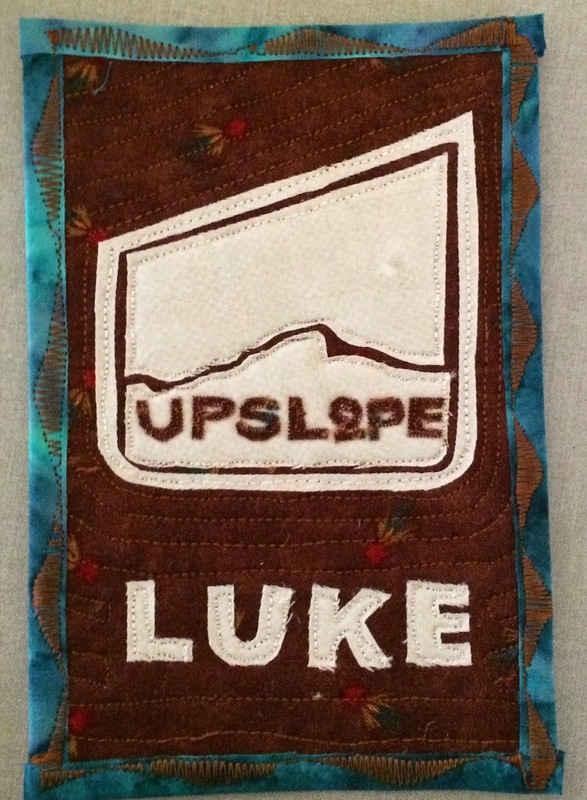 First I made one for Luke, the guy she has been seeing, for his birthday. Hope his birthday was all he hopes for and for many more in the future. He works for Upslope. 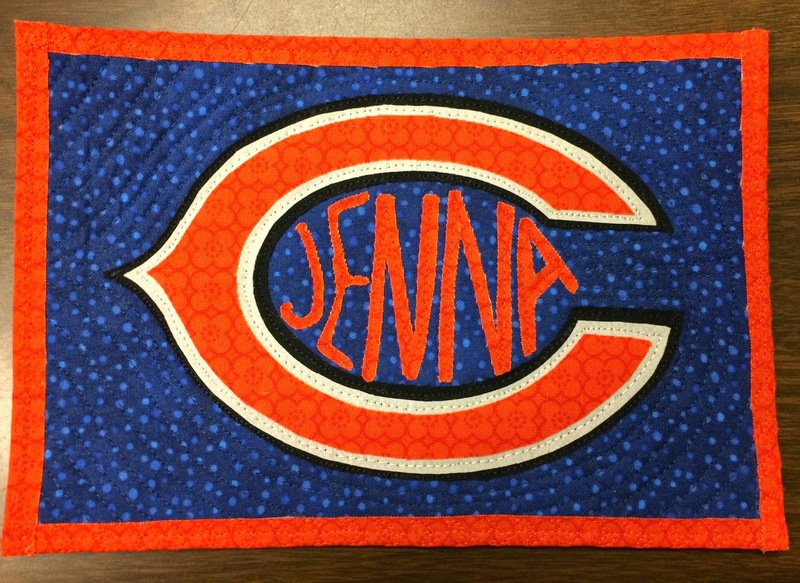 Then I made one for Jenna, a friend of Celeste's from work, that I met during Thanksgiving and I learned she is a huge Bears fan. She and I really hit it off. She is very much like Celeste, and is smart, fun loving and so cute. 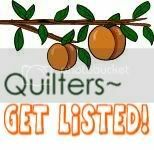 I want to do some writing on the magnolia quilt around on the black inner border, but I am scared. Maybe tomorrow. First let we wish each of you a heartfelt Happy New Year. I hope 2015 will be more than you hope for!! Still holding on to the no diet cokes...although I still want them every day. Hopefully that will pass soon. Trying to get some various soups in the freezer for January. Made a 15 bean soup that was really good, a lentil soup and a chicken soup. The second two were ok but not as good as the 15 bean. Think I will do a vegetable soup today although if I do, I will have to go get more tupperware as I am running low. On the quilt front I finished my siggy blocks for Possum Town Quilters 2 days ago and am working on sandwiching my magnolia quilt. It needs to be done in January so I need to get the lead out on that. My dad is in the hospital. He went in before Christmas and is waiting on surgery. They said he has A-fib and a valve that is not working right. So they are keeping him till they can replace the valve. Supposed to be Monday. Hope you will all say a prayer for him. He is mighty wonderful.